Move over Poopsie Unicorn Slime there's a new Poopsie toy to buy! This one is called Poopsie Sparkly Critters and they are going to sell fast! As well as the Poopsie Sparkly Critters another new addition are the Poopsie Cutie Tooties! We have put together a handy guide as to where you can find stock of both the Poopsie Sparkly Critters and the Poopsie Cutie Tooties, so why not bookmark this page as we will update it regularly. What are Poopsie Sparkly Critters? 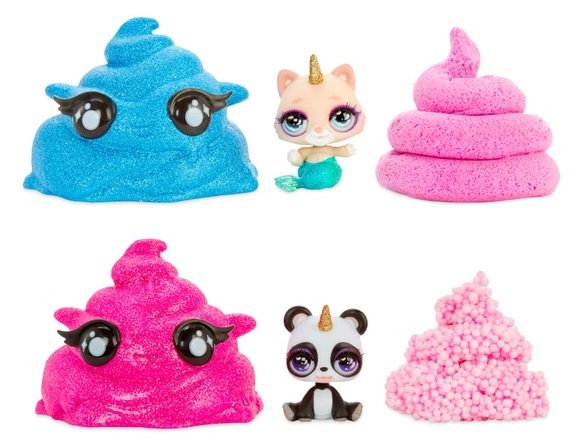 Poopsie Sparkly Critters are the magical slime surprise that spit or poop slime! Pop open the sparkly soda pop can package and spin the inside chamber to unbox lots of magical surprises! Each Sparkly Critter is an adorable animal with a sparkly unicorn horn! Feed Sparkly Critters water with their unique drink can to find out if they spit or poop slime! Transform the slime by adding Unicorn Magic, Unicorn Shimmer, and ultra-rare Unicorn Sparkle! Each set includes a resealable food-themed bag to store your slime. What are the Poopsie Cutie Tooties? Poopsie Cutie Tooties Surprise are a totally new slime and unboxing experience. Unbox a sparkly unicorn poop that can be popped using a tab on the bottom to reveal the slime surprise inside. Squeezing out the slime reveals the adorable Cutie Tooties character hidden inside .The scented slimes come in different textures, including water, crunch, and marshmallow slimes. There are over 25 different slimes to collect!